We've got ears, say CHEERS and say happy birthday to your special little ones with these Mickey Mouse & Minnie Mouse TWIN inspired party circles! 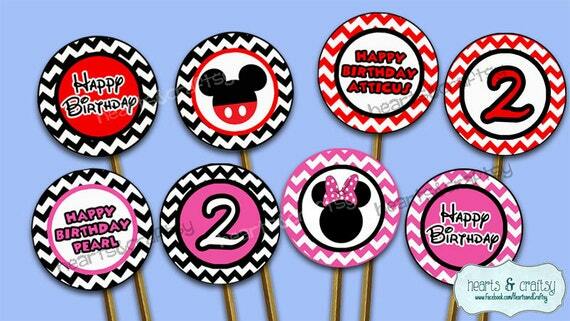 Designed with chevrons in red, black and pink and customized with the twins names! This listing is for custom party circles that you print yourself. There are 12 party circles per standard 8.5 x 11 sheet for easy printing. The circles measure 2 inches in diameter. No special craft punch required!!! Print as many times as you need! The watermark shown will not appear on the purchased circles. If no name is given in "Notes to Seller" item will not be personalized. This PDF file is NOT EDITABLE. Please add item to your cart and specify the CHILDRENS' NAMES and age you would like on the circles (ex: 1st, 2nd, 3rd birthday) and any additional information in "notes to seller.” Complete the transaction. Circles will come with the number "1" and no name if no information is left at ccheckout. Your order will be delivered to the email address provided on the invoice within 2 business days. Please note that nothing will be shipped to you. Digital files allow you unlimited printing and you can print from the convenience of your own home! Printed colors may vary from one computer monitor to another, one printer to another and even with different types or brands of paper and ink and also with the choice of printer settings. PLEASE NOTE: This file is for personal use only. You may not forward, share, sell or distribute the file. It is for non-commercial use only. All copyrights and trademarks of the character images used belong to their respective owners and are not being sold. This item is NOT a licensed product and I do not claim ownership over the characters used in my designs. Please note that you are strictly paying for my time to create your personalized item. Thank you for visiting Hearts & Craftsy!